I wasn't about to buy her, I was just enquiring as I had heard nothing about her for a while (she's been advertised as for sale for over a year I believe). If you are in the process of buying her, I wish you the very best of luck with her. However, I'm not sure that I understand the line "Don, don't you dare buy 2595". I'm sure that it just reads badly and wasn't intended as an order!! Don, just a request! !, I am afraid at the moment it is just a pipedream (if I still smoked one, It's now an offence is'nt it ), my pension/s don't run to it knowing from past experience of wooden boats and how much they cost to look after properly, I am realistic enough to know that there can be no half measures, as well as the ever increasing Marina fees in the Med, that's if you can find a berth, I was invited aboard around two years ago and she is/was a nice boat however her present owner like me is a bit limited on funds at the moment so I do not know as to whether she has had all the little job's that require doing on a wooden boat and need to be kept on top of done, hopefully in my case she will still be available when my funds are more fluid and I can retire to Gib. Lambs around £5 a litre if I remember correctly. Just had look at "Trigo" in Balloch someones been "At her" not sure if its to work on or the ply cover fell off! The cabin is now open at the rear off this week so think i will pop down and get some pic's. The planned building work for flats at the entrance to the marina has been put on hold....But i dont think Trigo has a lot of time left as the cabin is pretty rotten. Is "Trigo" the Balloch DWC featured else where on the forum? No takers or is she just to far gone? This TRIGO at Balloch, what is she? 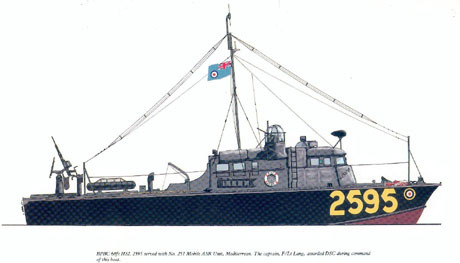 If she is a Seaplane Tender she is possible ex DANNY BOY as she lay at Balloch for some years. Have a look at page 1 onwards of topic "General Message Board on Where Boats Are"
I thought she was a Seaplane Tender but those in the know reckoned she was a Derby Class. Very interested to read about HSL 2595 on your website in a message in 2006. My father was Flight Lieut. James Fulton Lang, who captained this rescue launch off Sardinia during WWII. I am trying to find out what has happened to this launch, if she is still afloat and if anyone owns her ? HSL 2595 was on the boatyard at Badalona in May 2018 (Google streetview). Probably still in the area.